Summer's Here...Shine the light on your style! If you’re like me, you've already started doing your summer shopping…you've got multiple bikini’s and swimsuits for lounging on the beach, the cutest summer dresses for hanging out with friends, and enough designer sunglasses and sandals to last the entire summer, oh yes, you will be styled to the tee. But, what about your friends? What will they be wearing? What if you could style them too? You can become an instant fashion designer by building your own clothing collections and sharing your styling skills with the world! Like you, I enjoy reading my favourite fashion blogs to get the latest trends and tips on style and now you can take what you've learned and create amazing collections to share & make money! Put your fashion design skills to the test by designing summer collections and styling your family and friends! Choose from over 100 stores and hundreds and thousands of designers to turn your passion into profits. We have the hottest and latest sandals, summer dresses, clothing and accessories that are trending right now and if you need a little inspiration there are lookbooks and already assembled collections to spark your inner designer. You can create your own collections under your FREE LustreLife profile and share your collections via Facebook, Twitter, Pinterest or any other social media platform. Each time someone clicks on the BUY IT link and makes a purchase, You automatically earn a commission. If you create a popular collection, we will also promote it on our social media pages too, putting even more money into your pocket! It’s simply a cool, hip and trendy way to turn your passion into profits. Love places with commission. I've never heard of this affiliate program before. Sounds great. 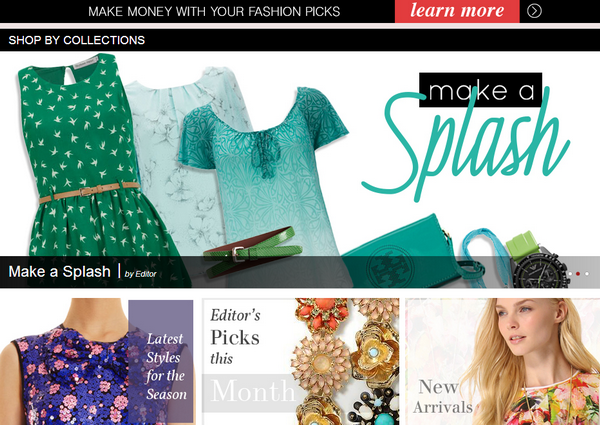 Looks like a great fashion site. :) You earn while creating your own profile.